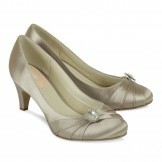 Dyeable wedding shoes are a wonderful option for your wedding day! First of all, the selection of beautiful dyeable wedding shoes is wide and varied with gorgeous embellishments, on trend styling and a range of heel heights and fittings. Secondly, these dyeable wedding shoes can be any colour, giving the option of colour matching to the bridal gown or bridesmaids can have their shoes dyed to match their dresses. Something else to consider is that, after the wedding day, you may want to wear your beautiful undyed shoes again, and you can then have your ivory dyeable wedding shoes coloured to match your special occasion outfit. All that's needed is a fabric swatch for the colourists to hand-dye to. Of course, many brides choosed to cherish their wedding shoes, but the fact that these shoes are dyeable is a lovely future option!